Gold and silver fell but U.S. Mint gold and silver bullion coins advanced. 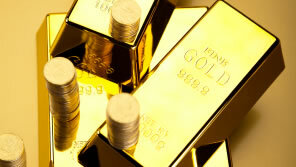 Gold, silver and other precious metals declined Thursday as strength in the U.S. dollar pressured commodities. Gold for April delivery fell $7.50, or 0.5%, to $1,671.30 an ounce on the Comex in New York. Gold had traded as low as $1,663.40 an ounce. Gold’s temporary rebound "was impressive in the face of a rising dollar, but the dollar’s continued strong rise today eventually forced more selling in gold, and the metal slid back downward," MarketWatch quoted Brien Lundin, editor of Gold Newsletter. It was "too much dollar strength, for too long." Gold so far this week has moved sideways to log only modest daily changes. It has gained 70 cents since Friday. Silver for March delivery fell 47.4 cents, or 1.5%, to settle at $31.403 an ounce. It traded between $31.295 and $31.935. Silver in the previous session gained less than a penny. Snapping a four-session winning streak and falling from a 16-month high, April Platinum lost $14.20, or 0.8%, to close at $1,722.30 an ounce. It ranged from a low of $1,721.10 to a high of $1,743.00. Palladium fell the most among precious metals. Palladium for March delivery declined $14.35, or 1.9%, to $750.45 an ounce, trading between $749.50 and $768.35. The following two tables offer U.S. Mint bullion sales for the day, week-to-date and year-to-date. *The Chickasaw total was adjusted down by -2,260 on Tuesday. Last week on Thursday its sales had trimmed by 40. Such negative adjustments are very atypical in U.S. Mint reported bullion coin sales. All coin sales above are in the number of coins sold. Calculate total ounces by using the bullion coin’s weight.